A common forensic task is to determine the position of a shooter in a crime scene. One technique uses bullet trajectory rods and calculations of intersection and extension. Photogrammetry, the science of performing measurements from photos, can be used to model the cylindrical trajectory rods, using a normal DSLR camera, and find their position and angles in 3D space. PhotoModeler has such a cylinder modeling tool as well as the ability to extend these rods virtually to help determine shooter position. 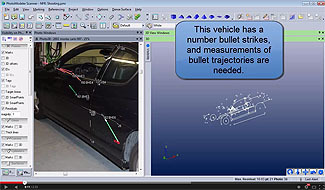 In the case shown in this video, the trajectory rods have been inserted into bullet holes in the side of a vehicle. A number of photographs from different angles are taken. A standard PhotoModeler project is set up, and the rods are modeled with the Cylinder Tool. The 3D diameter, position and angle of each rod are computed by PhotoModeler. A scale and a coordinate system are set up by the user so that real-world measurements can be made. To assist with the visualization of the trajectories, the cylinder objects have their ‘extension’ property changed in PhotoModeler. This extends the cylinder’s 3D shape so the user can better visualize the intended target position (in this case the driver), and visualize the shooter height and position (in this case a walk or drive by). As well, if two or more cylinders are selected in PhotoModeler’s Measure pane, the XYZ coordinate of the closest intersection is computed and displayed.